Huge pressure is mounting on African countries that have failed to effectively crack down on poachers who kill elephants for their precious tusks. British campaigners say the illegal trade in ivory has put the biggest beasts in the wild on the list of endangered animals. Experts estimate that 100 elephants are killed in Africa each day, at the rate of one every 15 minutes, according to some reports. In 1980, Africa had more than a million elephants in the wild. But a recent census suggests less than 300,000 of them remain. Top leaders have added their names to the campaign on illegal ivory sales. They include British prime minister David Cameron, African heads of state, Prince Charles and Prince William, who has said he wants the royal collection of more than 1,200 pieces of ivory destroyed. Last week British foreign secretary William Hague hosted world leaders for the biggest ever conference on illegal wildlife trade, attended by the Prince of Wales, as well as the presidents of Ethiopia, Tanzania, Chad, Gabon and Botswana. The meeting was held to try to hammer out solutions to the illegal trafficking of wildlife products. Action for Elephants UK, Care for the Wild and other groups of protestors, gathered outside the meeting in London to raise their voices in support of tougher measures to protect elephants. 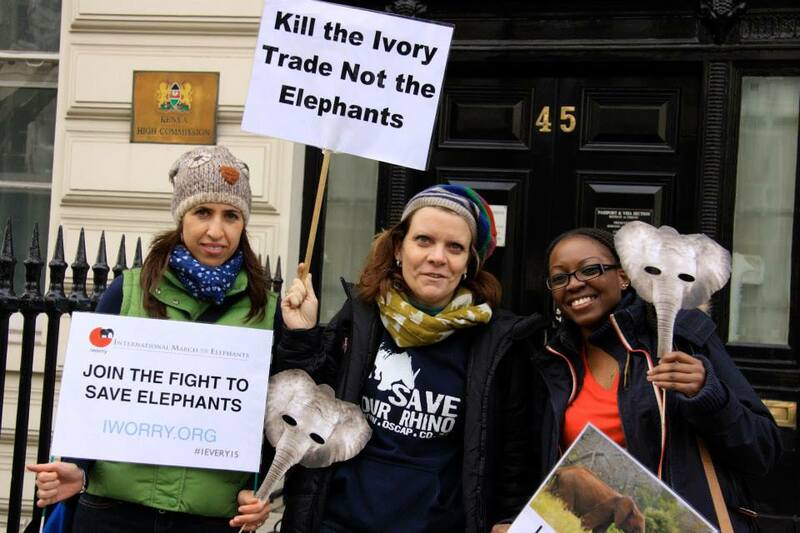 Protester Aurelia Anyika, a British NHS nurse who was born in Kenya, said: "We gathered there to speak out against the merciless, unsustainable, purposeless killing of animals, with species such as elephants now facing extinction in as little as five years time." She added: "Our message to the world leaders was that we need less talk and greed and more action and compassion, as our wildlife is quickly being killed off." Dominic Dyer, of Care for the Wild and TV celebrity Bill Oddie, gave inspiring speeches of support at the protest. The Convention on International Trade in Endangered Species of Wild Fauna and Flora (CITES) has in the past authorised the one-off sale of ivory stock piles from countries in southern Africa, allegedly causing spikes in poaching over the years. In 1997, CITES approved the sale of 50 tons of ivory which followed a poaching spike the following year. In 2002, CITES approved a 60 ton ivory sale which was followed by another poaching spike. Once again in 2008, CITES approved 108 tons of Ivory to be shipped to Japan from southern Africa, which was followed by the sharpest rise in elephant and rhino poaching ever seen. CITES authorised the sale despite objection from many countries in east, west and central Africa. Scientists have shown a clear link between the approval by CITES of one-off sales and spikes in poaching. Poaching is now estimated to generate more than £10 billion for criminal syndicates, including international drug cartels and terrorist groups. The authorities claim a thousand rangers, whose dangerous job it is to protect elephants, have been killed so far by poachers in Africa..
Campaigners say China is the world's biggest consumer of ivory and has a growing demand. It has carving factories where illegally gained blood ivory is turned into trinkets, ornaments, decorative pieces and useless medicines. Thailand is the second largest consumer of ivory, however this will soon change as a new law banning trading in the product was drafted late last year. Leaders at the London illegal wild life trade meeting signed a declaration that included an agreement not to sell any more ivory stock piles. A follow up conference to review progress, will be held early next year in Gaborone, the capital of Botswana.